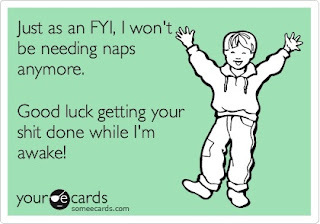 My son hasn't been napping for months now and it's driving me crazy. I would be fine with it except come 5:30 he is a disobedient, whiny, tantrum throwing little demon. Desperate times call for desperate measures right? I've started eating my lunch in hallway with his door cracked so he can see me but cannot easily interact with me. Within 30 minutes, the little stinker falls asleep. One the first day I did the quietest happy dance you've ever heard. And then I basked in the quiet until it was time to pick up Isabella from the bus stop. My afternoon and evening is going so much better now that he's sleeping. It helps that Isabella is in school all day and she cannot wake anyone up. It's amazing what a 90 minute nap can do to our day. I ordered 3 scarves yesterday and I can't wait for them to arrive. I've decided that I'm going to actually look stylish this fall instead of my usual jeans and fitted t-shirt. I figure the scarf will dress up my t-shirt and make people think I actually do have style. I'm not sure I'll be able to fool anyone but at least my neck will be warmer. Plus the scarves are really cute and I got all 3 for $14! I love closeout deals! Tomorrow the family is doing a 1 mile fun run. The whole family is excited about it - except me! I loath running. If you see me running and I'm not chasing after one of my kids, you should run too. Trust me, someone is chasing me! I hope my insane husband who loves to run and thinks 3 miles a day isn't enough exercise so he also plays soccer and takes body combat knows we are going to be walking at least half the time if he wants me by his side. I know my girls can easily run a mile straight but my son cannot. I think I'll hang with him! 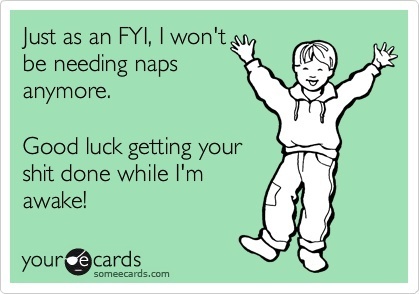 I'm not looking forward to the end of nap time. Between nap time and preschool, I'm more productive than I've been in months.